Aoshima Ogre's Washboard, Onino Sentakuita , refers to the interesting rock formations that surround the island of Aoshima in Miyazaki. The coast is covered in bedrocks that form natural geological patterns of lines and circular shapes. 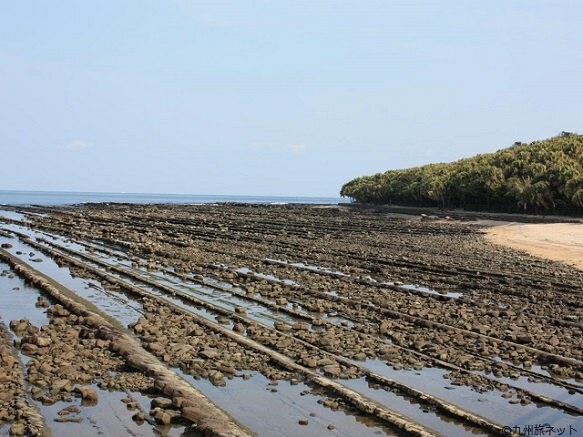 Beneath these rocks you can find some sea creatures hiding like sea cucumbers and octopus. 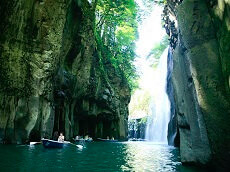 The island of Aoshima itself is also an interesting place to visit. 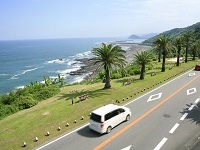 The beaches of Aoshima can be seen in a 1.5 km walk around the island. 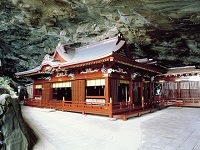 The island is home to Aoshima Jinja, a red shrine said to bring luck and happiness to married couples who visit together. 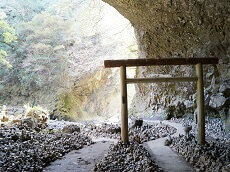 Those who walk further down the jungle where Aoshima Jinja is located will come across another smaller shrine where you can purchase clay disks to throw at a target there to bring good luck to oneself.